Implementing effective video interview tips can help propel candidates through the hiring process. Video interviews are very trendy, and many businesses rely on them. They are no longer exclusive to a particular industry, and are a great aid during the hiring process. 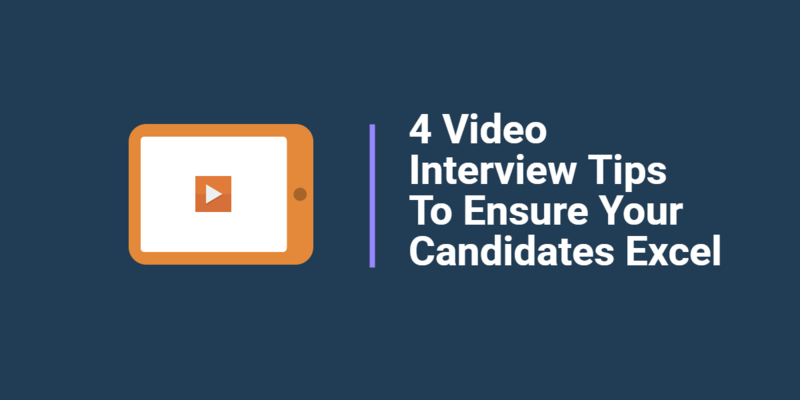 Some candidates may feel a video interview is daunting at first. It is quite different than the traditional in-person conversation. What can they expect? Why are they being asked to do this in the first place? For even the most tech-savvy candidate, video interview tips can help ease the anxiety they may have. Video interviews are a very different experience than heading into an office for a face-to-face conversation with a hiring manager. A candidate might feel uncomfortable talking to a video screen. They may not know how to handle tricky interview questions. To combat any rattled nerves, encourage them to record a practice interview before the actual video response is due. Doing so will help get them comfortable with the technology. Additionally, it enables them to optimize their environment so they can present themselves with excellent professionalism. Remind candidates to pay attention to lighting or any background noises during their practice video. If a candidate is especially nervous, consider inviting them into your office to record. This way you can offer any additional video interview tips to help them increase their chances at landing their dream job. Video #interviewtips can help ease anxiety, even for tech-savvy #candidates. The entire notion of video interviews can be off-putting for candidates who are new to the concept. Some may fear the company is less interested in them than in other candidates. Rather than letting your candidate’s imagination and fears run wild, provide them with information and plenty of video interview tips about why hiring managers are joining this job interview trend. Offering some more context might help a candidate feel more comfortable and confident when they finally record their answers. Once they’re aware of the benefits of this method of interviewing, they will be able to focus on their responses, and give their best performance. Remind them that details still matter, even though they won’t be sitting live with a hiring manager. It’s important to reinforce this point before you send your candidate to record a video response. It is good practice to sit up straight, smile, and never rush answers. Details still matter during a video #interview, even if its not live with a #hiringmanager. Candidates may find the entire video interview process unnerving; especially if the concept is unfamiliar. Candidates may wonder about the basics: do I look at the screen or at the camera? How will I know I’m talking too much? Candidates may feel uncertain about what to wear, which room they should record their responses, or even how formal their language should be. Provide some video interview tips on a cheat sheet that covers some basic tips for etiquette. Doing so will help the candidate remain comfortable and confident during their session. The best way to prepare for technical issues is by doing a practice interview to eliminate any misunderstanding of how the platform works. Provide your candidates with some information on the software they’ll be using. This will help familiarize them with the platform and help prevent issues that can arise. During the practice interview, ensure you are available to answer technical questions your candidates may have. Also, let them know how to quickly reach support should they need to troubleshoot any last minute glitches. Better than that, making yourself available during the time of their interview to aid in troubleshooting will go a long way in helping your candidates rock their video interview.